Some hikes go as planned and some just don't. 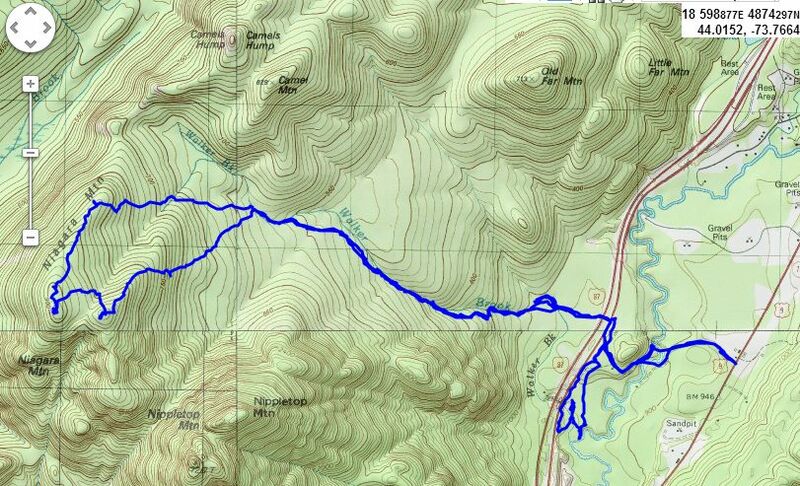 And if it's a bushwhack hike, forget it, all bets are off. Do you see what I am leading up to? 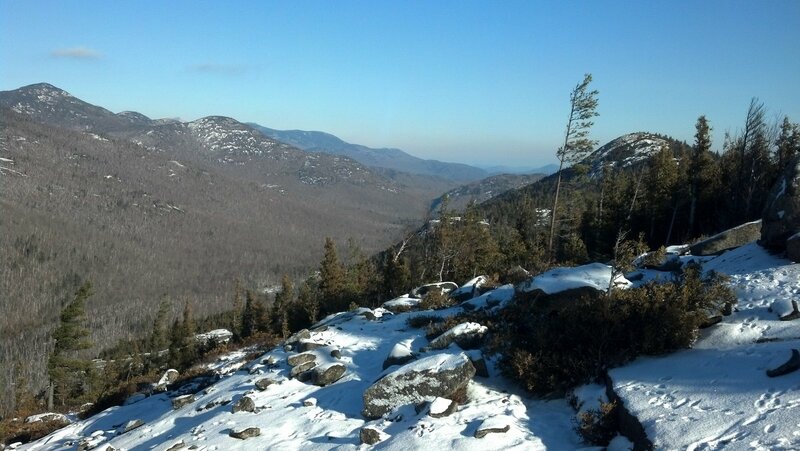 On this day, my thought was to do a bushwhack hike to Niagara Mountain, and if all was going well, to continue on to Nippletop Mountain in the Dix Mountain Wilderness Area of the Adirondack Pack. 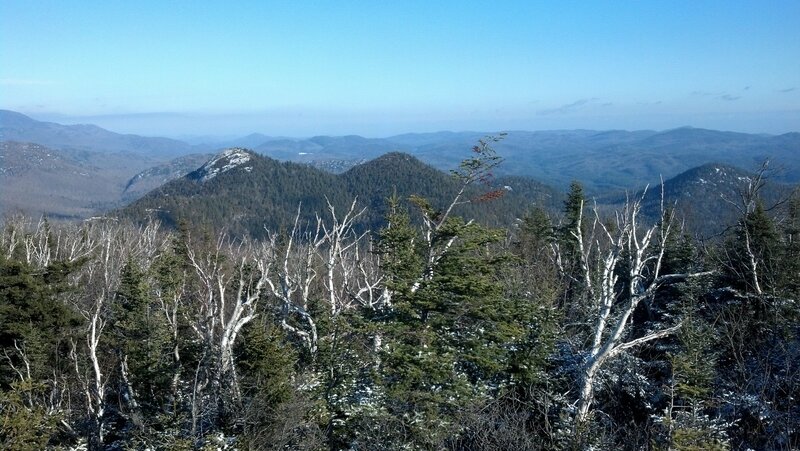 The access point for this hike is hard to find, but is on Route 9 in North Hudson just shy of 4 miles north of the Blue Ridge Road. There is no sign, and it's just a jeep road leading west into the woods. After a short distance the jeep road forks, with private land to the left and a ROW access to the right. Going right, the jeep road goes downhill to the Schroon River where the only way across is to ford knee deep water. I came prepared, with a pair of contractor 3 mil garbage bags to use to keep my feet and legs dry. Only one problem.... I got halfway across and found out the bags are not water tight. The seam at the bottom must leak. In the one minute it took me to cross the river, I had water in my hiking boots. Not good in 20 degree weather. Once across, I took my boots off and changed my socks. I knew the second pair would soak through since the inside of the boots weres wet, but I decided to hike anyways, and if my feet started to get cold, I would turn around. Immediately on the other side of the river there are steel beams that presumably were once bridge beams for a river crossing at this location. On the west side of the Schroon River, the jeep road had another fork. Since the right side had a posted sign, I went left, and what did I see? 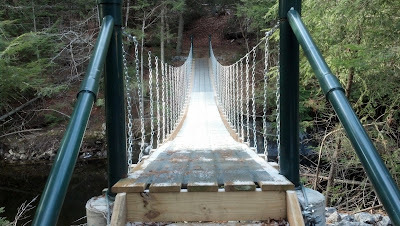 There was a brand new pedestrian suspension bridge over the river (only 100 yards downstream from where I had waded across). I'm not sure if not is on private property, but the east side of the bridge is on the earlier fork that was marked as private. 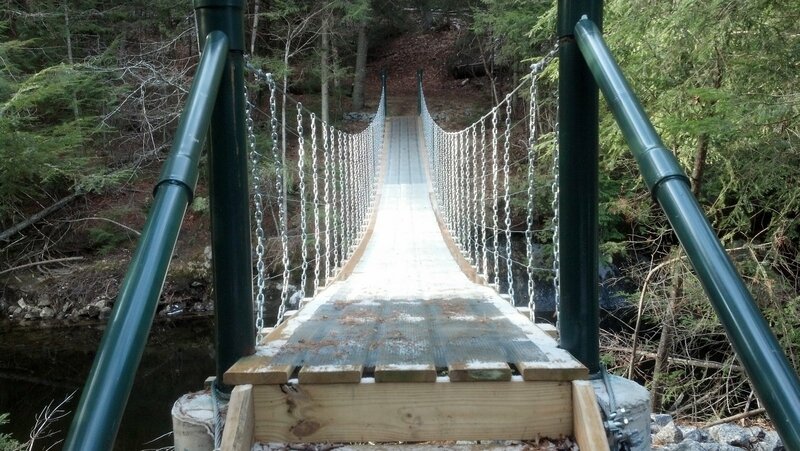 There were no signs anywhere near the bridge. 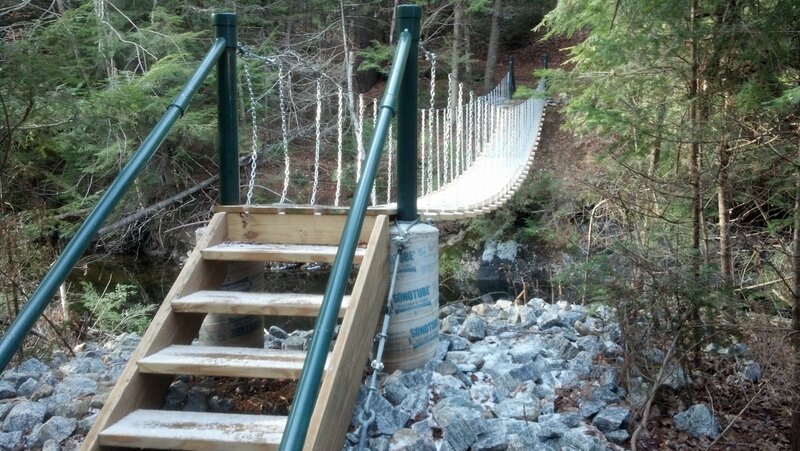 A new pedestrian suspension bridge over the Schroon River. I don't know if it's private or public. I continued west sifting through a maze of jeep roads until I found the walking culvert under I-87. 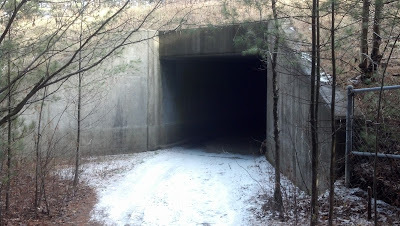 This culvert is a ways north of the stream culvert for Walker Brook. Once on the west side of I-87, a jeep road leads south and a foot path leads west. I took the foot path, which quickly leads to Walker Brook. It starts on the North side of Walker Brook, but after a short distance, crosses the brook and continues on the south side of the brook. The walk along Walker Brook was easy. 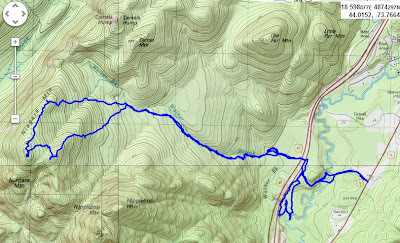 I followed the trail, which is unmarked, but is now shown as trail # 1 on the new Lake George/Great Sacandaga National Geographic Map 743. It had not been shown on the previous edition. The trail eventually peters before reaching the col between Niagara and Camel's Hump. 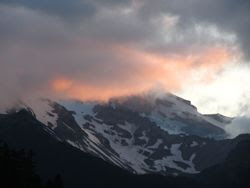 Rather than head for the col, I headed due west towards the first false summit on Niagara. Upon reaching it, I was surprised by a big white hare that jumped out from practically under my feet. It was gone before I could get my camera out. His tracks were all over the open rock. The views were great to the west and to the north. I pressed on, following the south-SW ridgeline of Niagara. It was quite thick in spots and the going was slow. 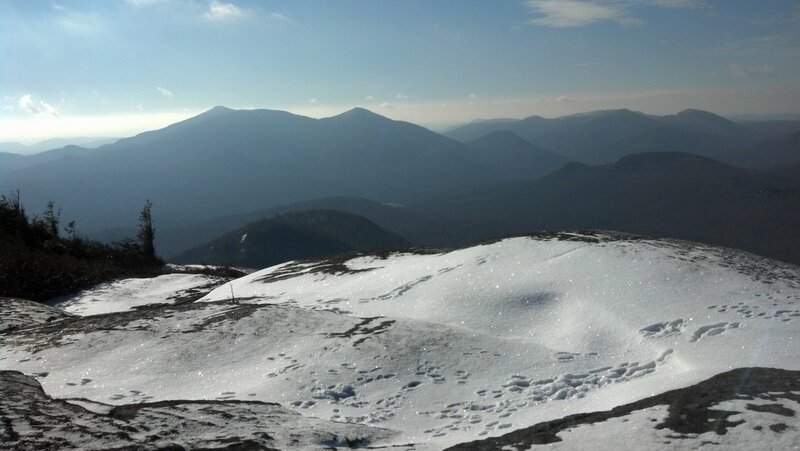 The true summit has lots of open rock and fine views in almost every direction except east. 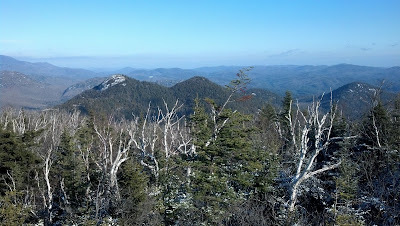 I took some pictures and enjoyed the summit for awhile before heading east to a slightly lower bump on the ridgeline. The trees and cripplebrush were thick, and I had to pry and claw through a few areas. Suddenly my pack felt like it was bouncing a little and I took it off to discover the main compartment was half open! It must have gotten caught on the some of the brush. To my dismay, I discovered I was missing: my sandwich, my tupperware of trail mix, one water bottle and my wet socks that I had taken off. Fortunately my best mittens and winter shell had not fallen out. They would have been the next to go. I retraced my steps for a little while, but to no avail. I didn't want to go backwards for very long so I gave it up. I'll have to look for them another day. Since I now had no food, less water and still had wet feet, I decided I better not head for Nippletop, but call it a day and head back to the car. 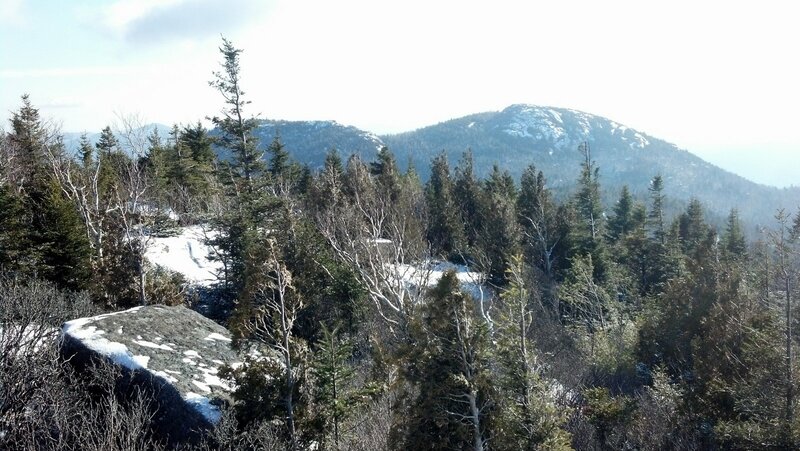 I headed NE and I descended back down towards the the Walker Brook trail. I noticed some deer tracks on the trail and could tell I had kicked out a pair of them. I saw them later as I continued downward. Once I reached the Walker Brook Trail, I followed it once again and was back at the car at 2:30 PM where it felt great to peel off my wet boots and socks and change into dry footwear. As I was driving south, I looked to see if I could see some of the new trails identified in North Hudson (as shown on the new National Geographic map). Right at the welcome to North Hudson sign (just north of the Blue Ridge motel, there is a jeep road on the west side of Route 9 that I found to be trail 6A (Fish Dam trail). 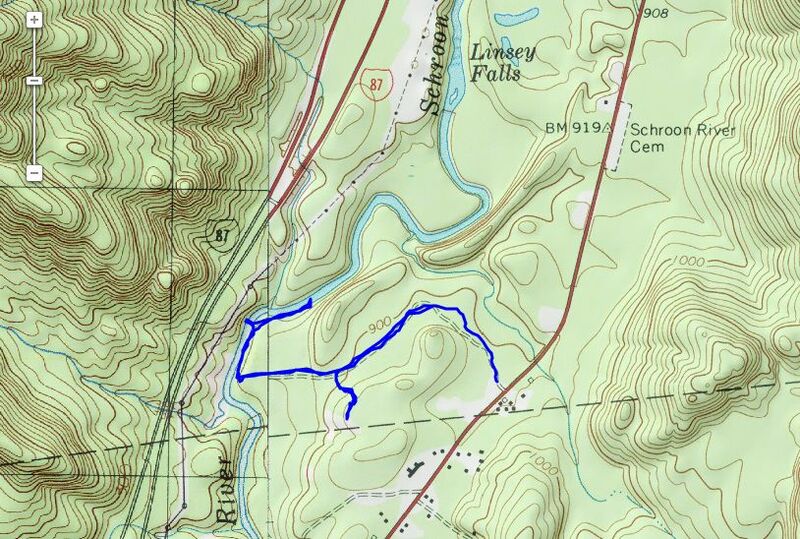 Once again, their is no trailhead sign and no markers, but the trail is shown on the map. This would be a nice XC ski trail as long as no snowmobiles or ATV's use it. 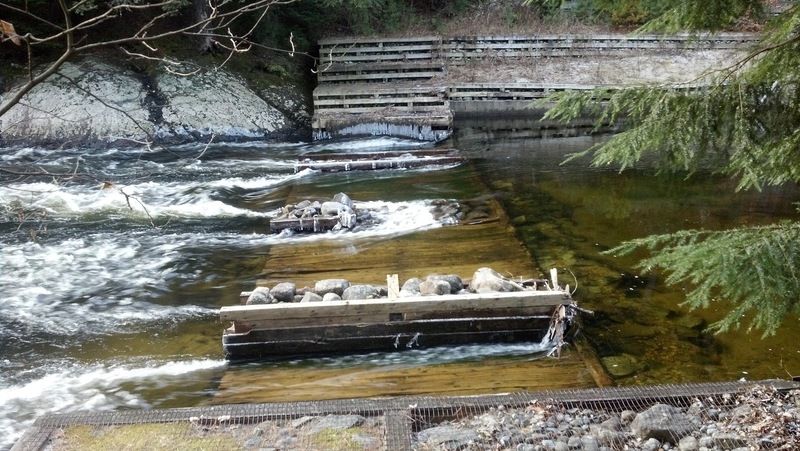 The trail leads to an old weir on the Schroon River. 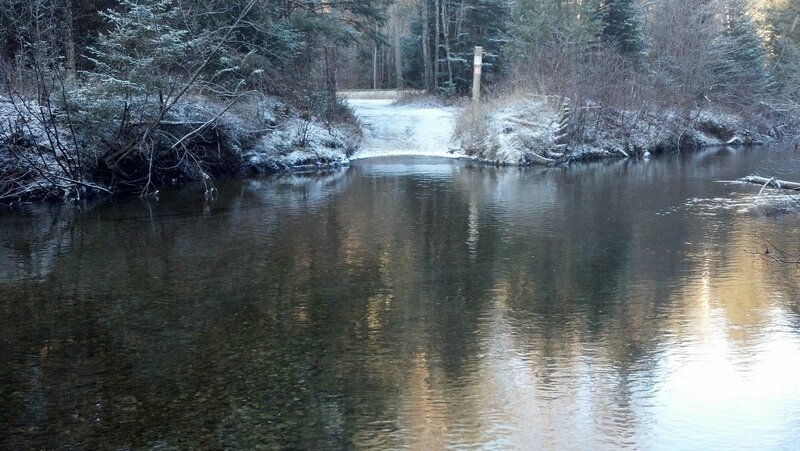 I had kayaked this section of the Schroon last summer when I had launched at the old Frontier Town. 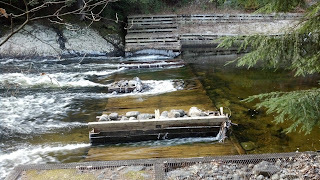 As I looked at the weir, I saw a small black mink or ermine in the cribbing. It came out and started to swim across the river until it saw me and then it turned around and went back in the cribbing. I had a nice day in spite of all the troubles along the way. The weather was clear and the views were nice. The wildlife was nice too!